Working out serves as a powerful tool for keeping you healthy and strong, especially during the nine months of your pregnancy. It aids in relieving body aches, easing labour pain and getting you back in shape faster. Still, it can be quite overwhelming to try workout routines that are doable and safe during pregnancy. While it’s crucial to inform your doctor about your fitness activities first, here are some fun starting exercises that an expectant mom like you can do. Hormones got you feeling down? Then boost your mood and reduce your stress levels by taking a leisurely stroll. Walking will also help in preparing your baby for delivery and in easing contraction pains as you progress into the last phase of your pregnancy. You might not want to choose a running routine given your current situation, but if you used to run before getting pregnant, then you should still be able to do this exercise without any problem. Just make sure that you scale back your previous routine and avoid running on trails that may cause you to fall or trip. Also, avoid running during an extremely hot weather as it might overheat your body and affect your baby’s development. Swimming is a perfect form of exercise to ease the pain and stress of carrying extra weight around your belly area. The water’s buoyancy will help in relieving some pressure off your body, while working it all at once. 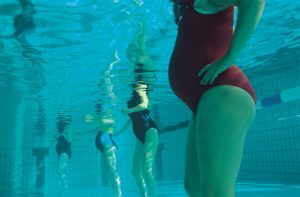 Although some worry that the chemicals used in pool water could cause some health problems, a study found that women who swam in chlorinated pools experienced lesser pregnancy complications than those who swam in the un-chlorinated water. Another great and safe way to get your heart pumping while you’re pregnant is to engage in prenatal aerobics. A regular aerobics class is also a great option for some, since it’s easy to lower its intensity and you’ll likely stay upright most of the time. As much as possible, avoid classes that require quick step changes or too much coordination, and just play it safe by doing marching or walking routines instead of jumping. Yoga works by calming the body and mind – perfect for pregnant women with a whole lot going on. 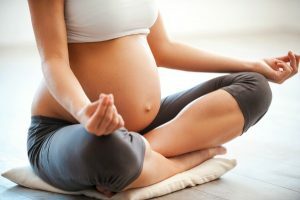 Apart from the relaxing feeling it gives, prenatal yoga has also been shown to help in maintaining flexibility and strength in pregnant women. The key is to enrol in a prenatal-specific yoga class, where the instructors will tune in to your specific needs. If you can’t seem to find such yoga class, try practicing pregnancy-safe yoga routines at home using some prenatal yoga instructional videos. Exercising is a crucial part of staying healthy while you’re pregnant. So start performing any of these workout routines now to ensure that both your and your baby’s health is its best state.